Moving house is a logistics nightmare... but imagine the challenge of moving an entire house - fixtures, fittings, brick walls, chimney and roof wholesale, through a major city, over a mountain range or across a frozen lake! That's the kind of impossible feat tackled by teams of movers in the dramatic hit engineering TV series, Monster Moves. 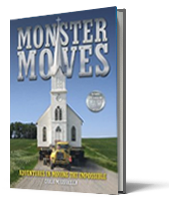 Meet the movers as they slice and dice mansions with chain saws, hoist church spires with helicopters and winch locomotives down highways with bulldozers. This book explores the engineering behind the moves, the epic races against time and tide, rows over red tape and risky routes, and the horror of what happens when it goes catastrophically wrong. 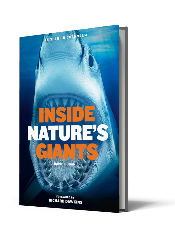 This fascinating book accompanies the award-winning TV series to explore the anatomy of the largest animals on the planet, revealing how these amazing creatures really work. Using an interactive approach, Inside Nature’s Giants and the brilliant accompanying App offers an exciting, alternative take on natural history. By opening the single- and double-page gatefolds readers can go beneath the skins of the animals to unlock the evolutionary secrets behind nature’s most extraordinary beasts. Featuring dissection, CGI and wildlife photography, as well as video clips and interactive maps on the App, Inside Natures Giants shows how evolution has enabled animals to thrive across the world, with the BAFTA award-winning team of scientists from the Channel 4 TV series to guide you along the way. This is natural history as you’ve never seen it before – from the inside out.